"My broadband connection has been provided by Zen Internet since it first arrived in the village. Today it was upgraded to fibre and although in theory they expect it to take up to 10 days to establish the reliable speed they can provide, it does appear to be a lot faster. Download speed has varied between 30MB & 70MB and upload load more consistently between 16MB&19MB. It was a self install which basically means plugging in the preconfigured wireless router they provide. I highly recommend Zen, perhaps not the cheapest but if you have a problem I don't think you can get better support." "The new fibre network is open for any internet service provider to use, but they have to choose to offer the service. Openreach have to provide equal access to any provider that wishes to offer broadband on the network. They can’t refuse access, due to rules that were introduced in 2005 when Ofcom said BT had too much of a Monopoly. This is what caused Openreach (who run the network) to be split off from BT (who sell broadband package i.e. an Internet service provider). Information about how Openreach operate can be found here -http://www.homeandwork.openreach.co.uk/openreach-explained/. The broadband part of AOL is now owned and operated by TalkTalk. Whilst TalkTalk are offering in a lot of places around the county they don’t seem to be offering in South Cambridgeshire villages. We have tried to ask them, but have never had a response. This will also be why AOL aren’t offering a service. Unfortunately when a provider isn’t offering in a service in an area the comments that come back to the customer seem to be Fibre isn’t available in your area yet or BT won’t let us provide in your area - both of which are false, but for them it gets them the customer who they can’t sell a package to off the phone. There are other providers other than BT offering in the Dry Drayton, so there will still be competition. I hope this helps. Kind Regards. Tony – CC "
So, when you talk to your ISP about upgrading - if they don't offer a service, press them to answer "Why?" - and please share your responses with us. We have now heard from two residents who were with ISP AOL who have been told by AOL that super fast fibre broadband is not currently available here in Dry Drayton. One resident has as a consequence switched to BT who are offering this service. Does this mean that BT is able to retain a monopoly position on this service? We are asking Connecting Cambridgeshire if this is the case. The situation on super-fast broadband is becoming clearer. There will be residents in the village who will be able to benefit from fibre optic connections to their local cabinets, and those who cannot. And there will be a limited number of connections available even for those able to use them, which will be allocated on a first come, first served, basis. We have heard that already a Cottons Field Resident has been connected into the cabinet at the junction of the High St and Pettitts Lane and is receiving BT Infinity - current download speed around 14 - 35mbps, depending on time of day. On the other hand the silver surfers at Pettitts Close cannot, and will not be able to, receive Infinity as they have "exchange only" copper wire connections to the distant exchange at Bar Hill, and are not connected to local cabinets in Dry Drayton. They can only get 5-10mbps "unlimited faster broadband". We would like to hear from other parts of the village - what is available to you? To find out, without any obligation, go to the BT Infinity site and input your phone number and postcode. So - we have been advised by the Connecting Cambridgeshire project team that the Dry Drayton cabinets have now been upgraded to fibre. www.connectingcambridgeshire.co.uk/parish/dry-drayton/. But, it appears that super fast broadband is not available to people in Dry Drayton. We have received feedback from local residents frustrated to find that they cannot sign up for this. But super fast fibre optic broadband, such as BT Infinity, is 24 to 76mbps download speeds. And with my current broadband supplier (Talk-Talk) I'm already getting 7.82mbps; slap bang in the middle of the quoted possible speeds from BT for their Faster Broadband. Kerry: Sorry about that, Homes are upgraded to this service individually after an exchange has been enabled for Infinity so what you can do is take our unique broadband package for now and upgrade as soon as Infinity is available to you without any penalties. Kerry: As BT Infinity isn't quite ready yet, you can upgrade once it's available to you with one of the great offers we have online. You can however give us your email address and we’ll contact you once BT Infinity is available where you live. DryDrayton.net: What if I want to check out prices with your competitors? DryDrayton.net: So my e-mail address is les@drydraytonpost.co.uk and my only real choice is to sit and wait until someone tells me this service is actually available? DryDrayton.net: Typically how long does it take for individual subscribers to be able to get the super fast service once local cabinets have been upgraded? Kerry: I am afraid there isn't a date listed when you can expect it, but there should be updates coming soon as BT Openreach planned to have 85% of the UK completed by the end of Spring, with the intention of having the rest of the UK completed in stages by the end of 2019. You can use the speed checker to register your interest in BT Infinity. Please click here to do this. Kerry: Is there anything else I can help you with? DryDrayton.net: Well I run a village website and have just publicised there that your service is available now - having been so advised by the Connecting Cambridgeshire project. I'll copy this conversation onto the website. Kerry: Feel free to Les. Kerry: Have a nice evening. I relayed these points back to Tony at Connecting Cambridgeshire. His view was that once the cabinets had been upgraded the speeds BT offered depended on a resident's distance from the cabinet and he understood that once BT had upgraded the cabinets if they couldn't offer Infinity (up to 76mbps) they were able to offer FASTER BROADBAND - an intermediate product with speeds up to 10mbps which only they and not their competitors can offer. In a second online chat with BT I tried to find the place on their site where I could sign up to be told when a super fast service would be available to me. I was told to ring customer services on 0800 800 150. This I did - and in conversation there learned that the 5-10mbps faster broadband was probably the only service I would get and it would be delivered to me at the same speed and over the same wires as my present service from TalkTalk. We may have misunderstood something here, but on the surface it seems like fibre enabled cabinets in Dry Drayton don't equate to a better service for most of us. We asked BT Press office for a comment and haven't had a response beyond an electronic acknowledgement of receipt of the query. We would be very pleased to add the experience of others to this page, so please let us know if you find a way to get super fast broadband in Dry Drayton. Super Fast Broadband now available in Dry Drayton - We have just been informed by the Connecting Cambridgeshire Project that the cabinets in Dry Drayton are now live and that super-fast broadband can be ordered. But – an enquiry a few minutes ago to get connected with TalkTalk resulted in the message that they haven’t yet been notified of this. Perhaps it will take a day or two for the information to work through the system. This crept a stage closer last weekend with the laying of the fibre optic cabling beside the A14. More work is being done on local cabinets before a brief commissioning period then go-live. Go-live is still scheduled to take place before the end of June, but the latest news may mean a couple of weeks shaving off that date. We will keep you posted. Meanwhile up among the silver surfers at Pettitts Close current speeds are: 7.76 mbps download and 0.85 mbps upload. They are still working on laying the fibre optic cabling beside the A14. This is taking longer than anticipated. However - Dry Drayton go-live is still in phase 5 of the project, which is March to June. "Is that the beginning or end of June?" our reporter asked. "Who knows." was the reply. Meanwhile up among the silver surfers at Pettitts Close, current speeds are 9.09 Mbps download and 0.87 Mbps upload. According to Connecting Cambridgeshire, most of the work updating cabinets etc doe the Bar Hill exchange has been done. The laying of fibre optic cabling along the A14 is now scheduled for the end of Feb, and the anticipated go-live date between March and June 2015 remains their best estimate of when customers will be able to receive super fast broadband. Meanwhile, up among the silver surfers at Pettitts Close, current speeds are 9.86 Mbps download and 2.44 Mbps upload. Sorry, but the latest news is not as we had hoped. The last thing we heard was that Dec 2014 was likely go-live for Dry Drayton. However, roadworks on the A14 have held up the laying of fibre optics and the latest info is now that our cabinets will be upgraded between March and June 2015. Our page on the Connecting Cambridgeshire website http://www.connectingcambridgeshire.co.uk/parish/dry-drayton/ has been updated to this effect in the last hour. Meanwhile, among the silver surfers at Pettitts Close, current speeds are 9.12 Mbps download and 0.87 Mbps upload. August 2014 - The Connecting Cambridgeshire site is difficult to pin down for our area - but if you go to the maps and double click on Dry Drayton it says that Fibre Optic cabinets for Dry Drayton will be in place by 31 December 2014. In July 2014 Councillor John Reynolds said, "Connecting Cambridgeshire, BT and Openreach staff are working closely to plan the broadband roll-out. 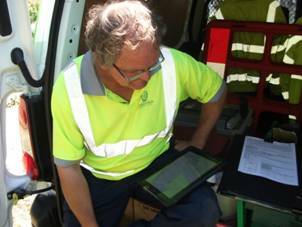 - Keeping you informed about the roll-out - The good news that the Connecting Cambridgeshire programme is on track with survey work in progress in some areas with the first cabinets due to go live before the end of the year has been welcomed as a sign that faster fibre broadband is on the way. To reach our targets for every community to have access to better broadband by 2015, we have tasked BT with planning the roll-out in the most cost-effective way. Initially, this means targeting those premises that will require the least work to upgrade the infrastructure connecting them to faster broadband services, then expanding out from there. " Look out for Openreach contractors surveying and marking out sites for new street cabinets. This means checking the stats for BT duct runs, electric cables, gas, water, sewer and cable TV, while looking out for conservation areas, listed buildings and any other factors that could affect the siting. You may have seen recent media coverage of the Public Accounts Committee report raising concerns about the nationwide roll-out of rural broadband. Please be assured that the issues raised do not apply to Connecting Cambridgeshire. 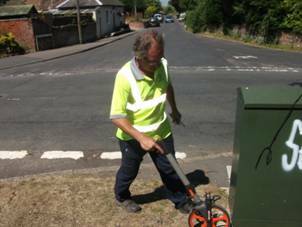 The Connecting Cambridgeshire broadband roll-out remains on track with work already underway to install some of the first new street cabinets so that they are ready to go ‘live with fibre’ before the end of this year. We have launched new ‘my area’ pages on the Connecting Cambridgeshire website (see below) to keep everyone informed about the programme as it progresses, and we are working closely with planning and highways teams to make the process run as smoothly and efficiently as possible. These are positive signs that the fibre broadband roll-out really is coming to Cambridgeshire and Peterborough. Some areas may have to wait a bit longer than others for better broadband, but without the intervention of the Connecting Cambridgeshire programme many would not get it at all. The launch of new ‘my area’ pages on the Connecting Cambridgeshire website with an A-Z list of 267 areas across the county is helping people find out ‘where and when’ they can expect to get superfast broadband before the end of 2015. Thousands of people have been prompted to visit the website to check their area pages and to register for regular updates. Read the news release here. This is just the start and we hope the ‘my area’ pages will prove to be a valuable resource as the programme progresses and we are able to add more details making each area page ‘bespoke’. able to get better broadband speeds of at least 2Mbps - and in many cases much faster. Some areas show broad timescales because they are covered by more than one phase. Work to connect premises will progress incrementally from the first date. We will be regularly updating the information, which will become more precise as the roll-out progresses. Connecting Cambridgeshire is working with ISPs to ensure that broadband services will be available from as wide a range of providers as possible. We will be sharing Cambridgeshire’s uniquely high demand registration levels with the ISPs to demonstrate the opportunities for broadband take-up and drive market competition to offer affordable services. The Connecting Cambridgeshire intervention area is based on mapping of future levels of basic and superfast broadband provision expected by 2015, as shown on the black, white, grey (BWG) Next Generation Access (NGA) maps on the website. State aid rules means the project can only intervene in ‘white’ areas that would not otherwise be able to get superfast broadband. As you can appreciate with a countywide project, it is not always easy to get accurate, detailed information which means we get an occasional anomaly in the data. It is always helpful to have a local view to help us to update our information, so please let us know if you come across anything on the BWG map or the ‘my area’ pages, which does not fit with your knowledge of broadband provision in your area. 3 October 2013 - from Peter Fane - an update on broadband rollout in Dry Drayton. 28 September 2013 - Rural Groups call for broadband review. A report from the Rural Services Network. 26 September 2013 - The Public Accounts Committee publishes a critical report on the way that the project is being rolled out - their report is here. Sept 2013 - News trickling through from Hardwick, which won the national BT competition for early super-fast broadband introduction, is that there are individuals there who are hanging on and waiting connection. Have you heard any reports on roll out there?